This week’s edition of Off the Clock is a story about three high school friends from the north suburbs of Chicago who started their 2013 freshman year at MU unlike most students. They arrived in Columbia and started posting flyers in search for a drummer. Ari Shellist, Tyler Stock and Jack Pritchett played together in a high school band for two years, and this time they were looking for the final member of their new group. With the addition of drummer Tom Hipchen, the band was complete. 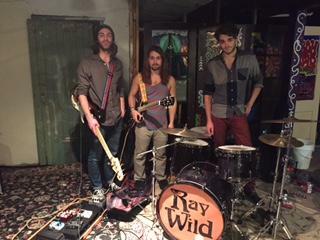 They call themselves Ray Wild, a name that lead guitarist Tyler stock said ‘just kind of came to him’. Two years later, it’s safe to say the venues have grown. I saw the four-piece rock band for the first time at Rose Music Hall in Columbia back in December and as I can recall, there were at least 100 people at the show. “We’ve had some great opportunities in the past few years,” Shellist said. Ray Wild’s sound is pure rock and roll – it’s raw, high-energy music made by talented musicians. And it’s all created in the basement of a one-story house. With a few instruments, amplifiers, microphones, a drum set and some decorative carpeting, the four roommates turned their empty basement into a music room. After spending just a few hours with Ray Wild and sitting in on some of their jam sessions, I listened as simple musical ideas started to take shape as new songs. “Usually someone will bring a riff or just some cool chord progression or something and then we just jam on it until it starts to take a little form,” Shellist said. Since the start of the school year, Ray Wild has played 11 shows with two more right around the corner taking them all throughout Columbia to Chicago, Kansas City and Lawrence, Kansas. That’s a lot of work… but an even bigger challenge is balancing all of the music with school. “It’s hard preparing for shows, having school and then other stuff going on,” Shellist said. So far, however, Ray Wild hasn’t let that slow them down. They released Good Fortune, their debut, 5-song EP in February of 2015. Now almost exactly a year later, the band’s second project is nearly finished. He said those three songs will be released as the band’s second EP after they finish post-production work, and they expect to release the project sometime in mid-March. Playing shows and writing and recording music with a band can take a toll on relationships. Success, like in any other professional field, requires time and hard work so it’s not unusual to hear stories about bands breaking up for any number of reasons. Five years together is a long time for any group of musicians, let alone a group of 20 and 21 year olds. But Ray Wild seems to be doing just fine. “We just kind of get on stage, jump around and go back to our roots of hanging out in the basement and playing,” Shellist said. Ray Wild is performing Saturday, February 20th at Rose Music Hall in Columbia. For more information on upcoming performances and the band’s EP, visit the band’s Facebook page.